City building used to be the exclusive province of land use planners and architects, but not any more. Increasingly, cities and even worlds, are being designed by computer programmers and animators. Think classics like Sid Meier’s Civilization or, more recently, Minecraft. But fantasy-based city and world building isn’t new. Sci-fi authors such as Aldous Huxley and William Gibson have long employed fantastical worlds in their stories such as Brave New World and Burning Chrome. 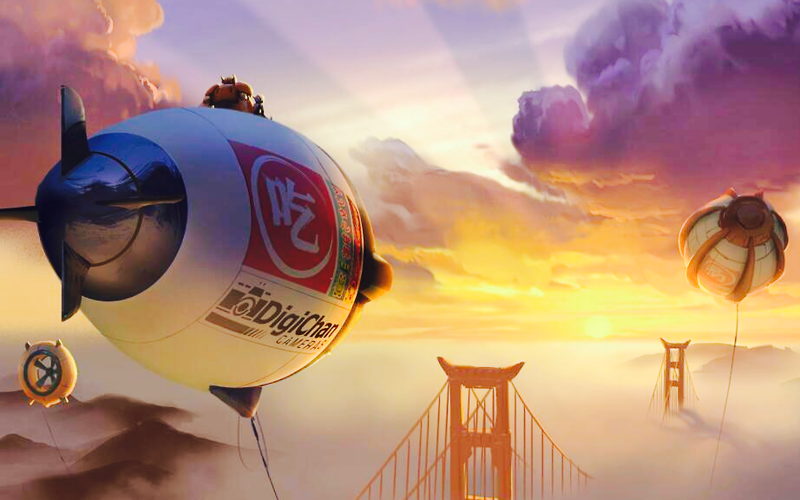 The first collaboration between Disney and Marvel, Big Hero 6 combines the magic and science behind two of the biggest names in the entertainment industry. By the way, as you’re reading this, I will have traveled from San Francisco to Tokyo so there may be a lapse in posts for a couple of weeks. Or maybe I’ll post some pictures from Japan. We’ll see . . .
Based on an obscure comic book of the same name by Marvel set in Tokyo, for the movie Disney and Marvel decided to create a hybrid city mashing up elements of San Francisco and Tokyo, much like the mashup between Disney and Marvel themselves. The hybridization of San Francisco and Tokyo works well. Both are well-known cities known for their high-tech, cutting edge culture and, proximately speaking, are perhaps the closest metropolises dividing the East from the West. To create San Fransokyo, animators used property data from the City of San Francisco’s Assessor-Recorder’s office – which, thanks to the city’s progressive open data program – allowed animators to get detailed information about the city’s 83,000 buildings and nearly exact location of elements like city streetlights and city trees. Using this information, designers could zoom anywhere and you would know exactly where you were. From there, the visual effects team altered the architectural styles of San Francisco, and its natural and built topography as well. San Francisco is known for its famously steep hills and impressive skyscrapers, but the designers made the hills twice as high and doubled the height of skyscrapers. The result is a futuristic Pan Pacific style complete with turbine outfitted blimps providing power for the city. Even the iconic Golden Gate Bridge was given a makeover. 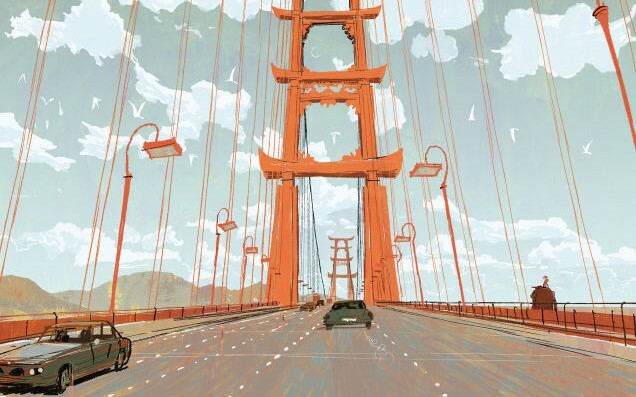 While animated films traditionally start with a story board to which visual detail is added with matte paintings, in Big Hero 6, digital modeling allowed directors a new way to pick their shots and center their action. If the directors decided they wanted a scene set in the Financial District, for example, the pre-generated digitally universe, which Disney has called “digital scouting,” allowed them to go there. The sheer amount of data required to accomplish this task required that Disney custom build supercomputers to handle this amount of information. Indeed, the system was so big, the computers had to be geographically located in four different places, three in Los Angeles, and one in San Francisco. 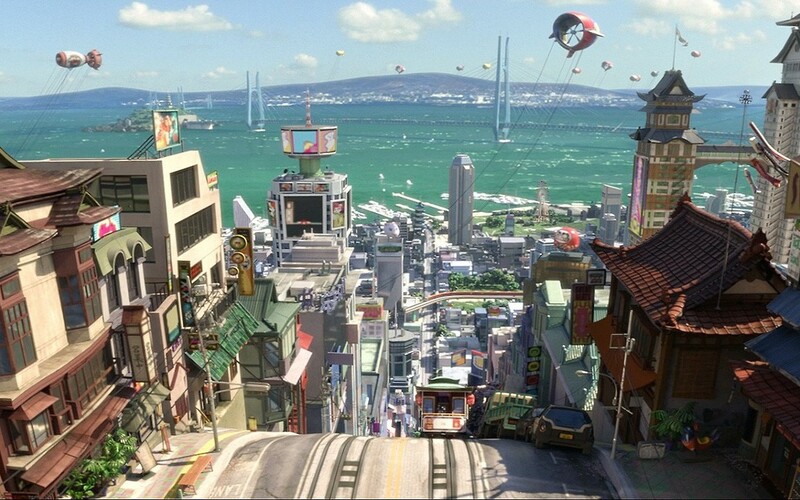 In one scene, Hiro and his robot Baymax fly over San Fransokyo. The detail of the city exceeds that of the last three Disney films combined. 750,000 people were digitally created for the film – about the actual population of San Francisco – of which 6,000 people were featured in the opening shot alone – each of them unique just like us. Pretty cool. See you on the other side.